The Deck to Win Worlds: Sea Blaster! With all of the new cards in the format, most players are still trying to figure out the correct way to implement them all. I decided to go underground (about 2 miles underground) with every card from HGSS to Triumphant to try and figure out the best and most powerful ways to use these cards. The time spent underground was mind numbing. After 2 weeks I started to run low on oxygen and electricity. I had been down there so long I forgot the way out. To even see I had to burn Pokémon cards tied to stalagmites I tore from the ground. The holographic ones seemed to burn longer so I used them first. After four weeks underground I have emerged, and based on the cards I had, I created the most powerful deck that could be made in an oxygen deprived, dimly lit cave using cards I didn’t burn. I think it could win any tournament it is played at. Here it is, Sea Blaster! Now let’s start off with the Tentacool. 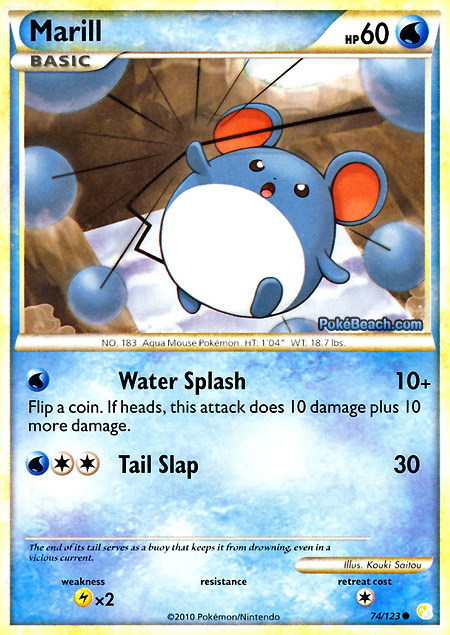 For one Water Energy, he has an attack that does 10 damage, and your opponent can’t retreat. This is one of the bravest Pokémon to ever live. He is standing there with his 60HP and his x2 Lightning weakness saying to the other Pokémon: “Hey! You can’t retreat!”. He knows very well that he needs one to retreat, and here he is taking a stand against all odds. I use him to attack when my opponent is in doubt of my bravery, and I want to show him what I’m made of. You know those wimpy Sableyes and Smeargles that keep retreating? They will be in shock and awe of this beast telling not only them, but their buddy Unown Q that they’re not going anywhere. Now onto the Slowpoke. His attack costs one Colorless Energy. Are you kidding me!? That’s like… ANY type of Energy! If this deck had some Fighting or Lightning Energy, YOU COULD USE IT! That’s a great idea for those of you interested in improving this already perfect deck. Try teching in some other types of Basic Energy so that Slowpoke can have some variety in his Energy. I mean he only gets one, why not make it nice? Now his attack does 10 more damage than Tentacool, which is great, but it doesn’t get the bravery of Tentacool. Now for the main attacker himself. Poliwag. Yea that’s right, he is incredible. He is so good that Pokémon feared him becoming too valuable. They knew that the lone Poliwag could win any tournament, and would instantly become more expensive than gold. 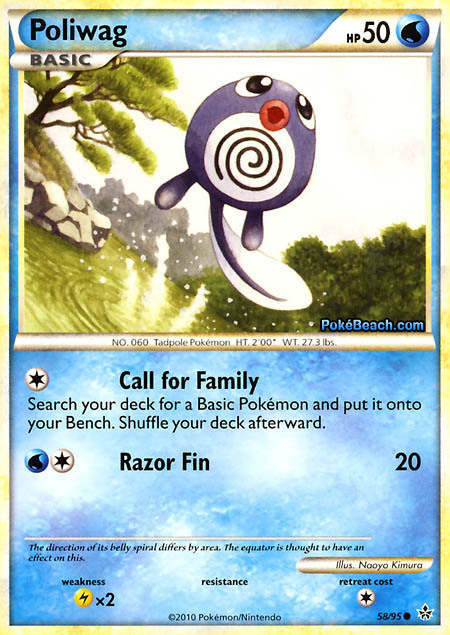 To prevent this from happening, they gave thousands of copies of this card as a promo at all 2010 City tournaments. Unfortunately, no one has realized the power of this card. Let’s look at this monster. Alright, have you caught your breath yet? Yea, this guy is leaping out of a lake. We’ll talk about the background later though. You can see on this card three stars. If you’ve ever played the card game, you know that stars mean that the card is good, and this card has three! Now assume you’re fighting my ferocious Sea Blaster deck with one of your VilePunch or your ChompBlazes and your SablePop ‘N’ Locks. If I come out with Poliwag, you know you’re in some trouble because he can just call for his friends. He’s probably got a cell phone somewhere on him and he can just “drop a call” to Articuno and let him take care of it. I didn’t have any Articunos, but you may consider teching in some Articunos. Actually, no because the deck needs 31 Basic Energy and all of the Pokémon are completely necessary. No Articunos! Now you may want to double take at this next move (but don’t just stare) and imagine the possibilities. Razor Fin. I know, and look, it only costs two Energy, and one of them can be any type you want it to be! Now I know the attack only does 20 damage, but what if he was Belted? Now that’s 40 damage. Now add four PlusPowers, now he’s hitting for 80! And what if the defending Pokémon is Fire type? Oh yea. 160 damage. Sadly none of the cards mentioned are in the deck, but with that much potential and Pokémon’s faith in the little guy behind him, he doesn’t even need that stuff. I’ll move now to Marill, but I won’t spend much time on him. You can easily see how good he is by what I’ve already explained. You get the intimidating carelessness of a coin flip. The cost of the Water specific Energy is that you always do damage. Heads or tails, your opponent is going down. He’s also got stars going for him and WHOAH! LOOK AT THAT HE’S COMING AT YOU! Oh no! Swinub is my Scizor and Steelix Prime counter. You may be asking me “Well hey now Travis, why is he your Steel type counter when he is clearly x2 weak to it? You make worse decisions than Ash Ketchum!” To that I would say, “NO ONE makes worse decisions than Ash Ketchum.” Furthermore the weakness is exactly why he’s my counter. The steel Pokémon concentrate on the Swinub long enough for me to charge up my main attackers. It’s a risky move, but anyone can agree that a Swinub is really the only way to deal with Steelix and Scizor Prime. No one has found any way to beat them other than Swinub, and rumor has it that even LuxAmahoozitz Decks will be putting in 3 Swinubs into their decks just in case they run into one. If you see that done just remember that I invented the idea and we’ll be square. I saved this one for the end because he is by far the greatest Pokémon card ever printed. His name is Staryu, and he is so insane I can’t accurately describe it without hiring someone who is paid to explain things. If you look closely, there are 8 Staryu in the deck. I know the rules say you can only have 4 of a card with the same name in your deck at once, but let’s face it. Staryu doesn’t care about the rules. You may have to do what I did, and split it up in the deck list so the judges don’t call you on it. First off, check it out. In the background. You see that bridge? That bridge connects one of many islands to another. All 5 of these islands make up Staryu’s Star-Shaped Japanese-Themed Beach House! Remember Poliwag? Yea he’s chilling at Staryu’s place. Just look at the cards. You all know how cool Poliwag is, and Poliwag wishes he could be Staryu. Poliwag cries himself to sleep at night wishing that just for one day, Poliwag could be a famous and powerful as Staryu. I don’t know how valuable these Staryu cards are, but seeing as I only have 8, they’re probably worth a couple million apiece easy. Now let’s check out a battle scenario. You have a Poliwag up front. He’s already called up all of his friends, and now he’s severely injured because he was talking on his cell phone in the middle of a fight. He has one Energy, and you have one Staryu just leaning back on your bench. What do you do? 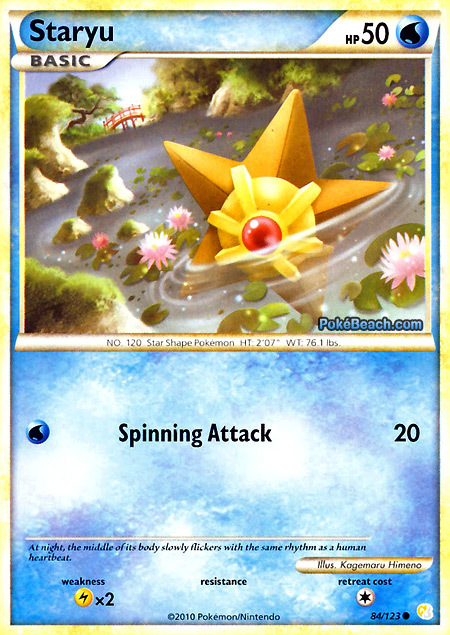 Those of you who said attach and Energy to Poliwag and use Razor Fin, just stop reading now because you’ll never understand the full power of Staryu. 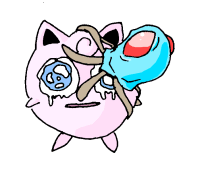 You retreat your Poliwag and attach an Energy to Staryu and SPINNING ATTACK WHABLAM!!! When you got a star fish spinning all up in your face, you don’t have time to think about doing anything. Your opponent might just draw and pass after you unleash such a ferocious attack. With all of this in mind you can clearly see why this deck needs 31 Water Energy. Where else are the water Pokémon going to live? I don’t know about you, but I’d imagine that any place where time and space are breaking would be pretty unpleasant, and I’d rather not have other trainers touching my Pokémon. It’s obvious this deck has so many good match ups, it’s insane. Instead, let’s go over the bad ones. The water weakness on Donphan will guarantee you some easy prizes. If all else fails, just rub some of your Water Energy on him to rack up massive damage. You know you have enough Water Energy, don’t be stingy with it. 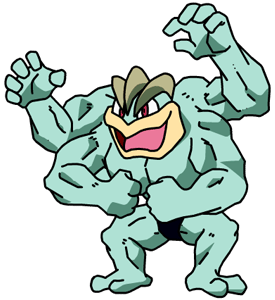 Machamp has four arms though, and all he does is work out. If you worked out a lot too you wouldn’t be reading this, you’d probably be working out, so he’s a pretty scary guy to all of us. Machamp has prepared a two step plan to deal with everything in this deck. First he Takes Out. Then he works out. It’s done great work for his biceps and his calves, but it doesn’t fare well for Sea Blaster at all. Let’s face it. All of your Pokémon are just chilling in the water. They’re powerless against a MEGA TADAL WAVE! You could take upwards of 150 damage with the way the deck is laid out, but let’s face it, Kyogre is the ultimate Water Pokémon anyway, so you can’t really ever hope to step with him in the water. I hope everyone stops and just thinks about the new ground I have broken in the Pokémon Trading Card Game. It’s implied that I will be in the top cut at worlds, so expect to see me there with this new incredible deck SEA BLASTER! Travis, I mean no offense to you, but I didn’t really like this article much. Sure, there was some funny stuff, but it wasn’t THAT great. I will admit that it was something different, though. Honestly thought it was so good. Pretty sick of reading about how Cities are going to go and how people won with LuxChomp, and this was great. I always look forward to your comment. You dislike my articles yet you still find the time to read them and comment on them. I can’t say the same about any of yours though. I’m sorry, but learn some manners. It very real. Would I waste that much time on a joke article? Actually I would…. WHY DID YOU POST THIS!?? Now everyone will play it and my VileGar will go 0-5 at EVERY tournament. Say goodbye to originality in decks. Best Article of 2010. You should write for Underground since you have so much experience actually being underground. That was an awesome video… No offense. Oh no, the Primape is as important as the 31 water energy and the 0 trainers. After watching that video, I feel compelled to be honest with you: Travis, I wish you would’ve stayed underground forever and that the hole you were in would have caved in and boulders would have crushed your rib cage, pinning you in the caverns and causing you to slowly die of suffocation over the next several weeks so that you could have never written that article. It’s nice to have a solid article that breaks all of the monotony of preparing for cities. Thanks for a great read and allot of great humor. I don’t think I have ever read a positive comment from you on any writing outside of your own. You telling Travis “I mean no offense to you, but I didn’t really like this article much. Sure, there was some funny stuff, but it wasn’t THAT great.” and then adding “I will admit that it was something different, though.” is similar to telling a woman she is ugly but that on the upside, she has pretty handwriting. You can’t tell someone something negative and then expect some small snide remark at the end to make things seem less harsh. Even the way you elaborated on “THAT” when you said “but it wasn’t THAT great” just screams disgust. And the sad truth to the whole thing is you actually write for sixprizes on a semi daily basis. You write articles for people, in order to HELP them and yet all of your comments are completely derogative of your means for writing for the site in the first place. If you’re so great at writing why not use the comment section to offer writing advice instead of being hateful. Everyone is tired of reading your crappy 2-cents. Heeeeey…. thanks… *Grabs a newspaper* that video was well done lol. No man. He is dead on. Are you seriously trying to make a competitive water deck with only 31 energy and NO LAPRAS?!?!?! PD: The 8 staryus brought to my mind my newbie era when i run 6 potions on my lapras/magmar/weezing deck. Vileplume – This deck has no allergies. Gengar – This deck isn’t afraid of ghosts. Machamp – I would rather dine in rather than take out. Very similar yes. But that’s because Zubat is going to be the other deck at worlds. It’s going to be Zubat Vs. Staryu… the world might explode. I’d say this is a forum post, not the front page. After the 100th tournament your play in, Primape will enter your dreams in spirit mode, and explain the correct way to use him. He’d rather me not give his Spirit dream away, but let’s just say it makes Staryu look like he can’t do anything. I just went to my 100th tournament this past weekend and just last night, Sprirt Primeape visited me in a dream. He told me the only way to harness his power was “to tech in a Mankey and some fighting energy so I could use him.” I playtested it against my 4 year old brother, and now my win percentage has skyrocketed from 100% to 110%! While I may have told you the secret, I suggest everyone visit their own 100 tournies with this deck because only Spirit Primeape knows the secretest secret to victory. Thank God for Adam Capriola being kind enough to let this deck be public knowledge as opposed to underground content. Well not exactly. Now that I went to cities this Sunday, they game me one of the most expensive cards in the deck as a promo. Poliwag. It’s like the DGX promo! Let’s buy like crazy! This is pure… AMAZING! Totally going to play this! :D It will be EVERYTHING! Thank you so much for revealing this magic. I have a feeling some others will still be iffy and decide to run the X/chomp decks or Vilegar even garados.. but little to they see in that pure wrath of Sea Blaster! I see you did not take my advice given in the ‘Art of Losing’ article. If you are going to make a criticism, make it a constructive one. Take advantage of the slowpoke colorless energy requirement. Also needed for primeape so it does double duty. dude, he was giving decent criticism. that’s better than what I did to Zach Lesage’s Gyarados list with Professor Oak’s Visit. Oh, I had no idea 6hkoing the 2 cards in luxchomp will win because they ohko you.